Hello everyone and happy Monday! I hope everyone had a great weekend! Today I wanted to take a moment to cover Ponie Oasis with you all! As most of you know, Amaretto Ranch Breedables offers a unique point system for ponies that you no longer wish to keep. Basically all your Ponie Pals have a point value in Ponie Oasis. You have to confirm to send a Ponie to Oasis, therefore it cannot be reversed. So make very sure this is something you really want to do. Even if it’s done by mistake it cannot be undone. So please be careful! If you wish to purchase any of these products you simply click on the board or box and you will receive a drop down menu asking you to confirm your purchase and the point cost. Once you confirm this purchase your order will be sent to you in world within moments. 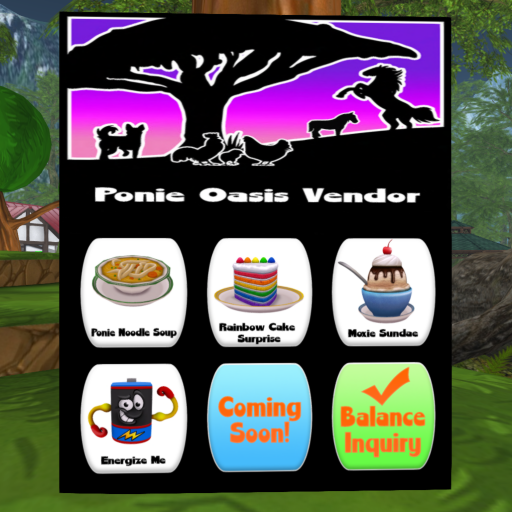 I hope you all learned a little something new about Ponie Oasis!